Canada’s Clean50 Awards are announced annually by Delta Management Group and the Clean50 organization to recognize those 50 individuals or small teams, from 16 different categories, who have done the most to advance the cause of sustainability and clean capitalism in Canada over the past 2 years. Tony and Francisca were chosen after rigorous screening and research by Delta Management, with advice from internal researchers and external advisors, and were among Honourees selected from an initial pool of approximately 600 well qualified nominees. Quinn & Partners was proud to share the 2017 Real Estate Excellence (REX) Green Award of the Year with the Healthcare of Ontario Pension Plan (HOOPP) for advancing sustainability in real estate with the one-of-a-kind Leadership in Environmental Advancement Program (LEAP). The REX Awards are presented by The Commercial Real Estate Development Association (NAIOP) and celebrate the achievements of the office, industrial, retail and mixed-use real estate industry in Toronto. 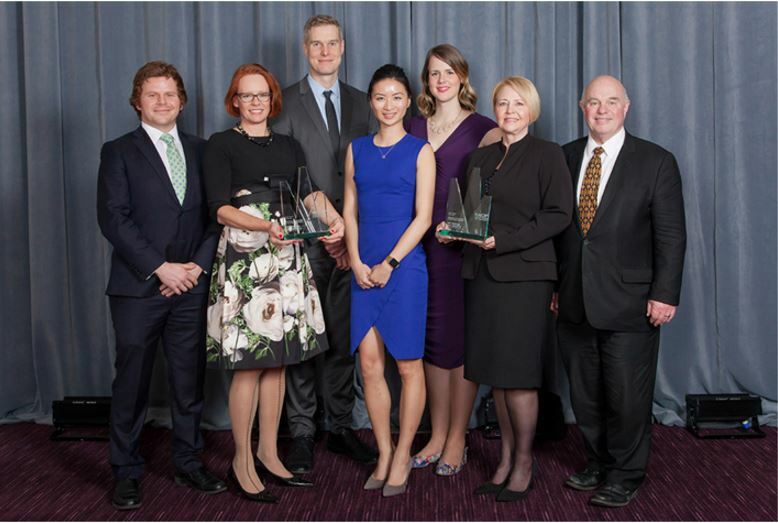 The Green Award of the Year recognizes excellence, innovation and achievement in sustainable real estate projects, initiatives, processes or community contributions. QUINN & PARTNERS IS A B CORP AND A BEST FOR THE WORLD HONOUREE! Quinn & Partner is a certified B Corporation. B Corps are certified by B Lab, a non-profit organization, to meet rigorous standards of social and environmental performance, accountability and transparency. We are joining more than 2,100 certified B Corps around the world and 150 in Canada that are using the power of business to solve environmental and social problems. The certification allows us to differentiate by “walking the talk” and communicates our commitment to responsible business practices to our clients, employees and the broader business community. Quinn & Partners currently has the fourth highest score of B Corp certified Canadian sustainability consulting. In 2016, Quinn & Partners was named a B Corp Best for the World honouree. Each year B Lab releases a Best for the World list featuring companies that constitute the top 10% of the B Corp community in five categories. We are proud to have been included on the Best for Workers list. This achievement validates our commitment to best-in-class employee practices. The COP21 Conference begins in Paris in just 6 days. It is expected to attract close to 50,000 participants including 25,000 official delegates from governments, UN agencies, NGOs and civil society. Over 11 days, countries that want action on climate change will convene to discuss the issues we face, the solutions we need and the timeline we need to act within. 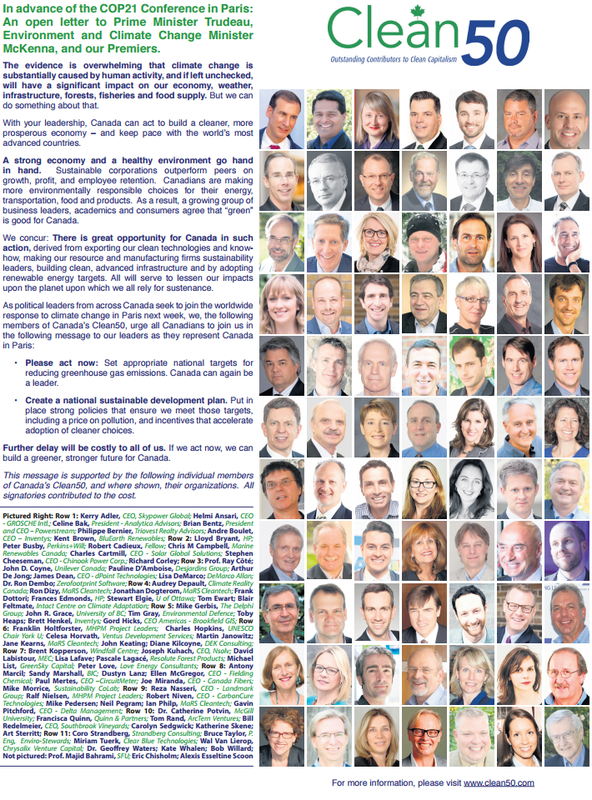 In advance of COP21, a group of recognized Canadian sustainability leaders, the Clean50, has drafted an open letter to our political leaders attending the conference, Prime Minister Justin Trudeau, Minister of Environment and Climate Change Catherine McKenna and our Premiers. The message, penned at the Clean50 Summit this past September, sends a clear message to Canada’s COP21 delegation that encourages them to take significant steps to raise Canada’s commitment to fighting climate change, and then work together to create an action plan to meet those targets. Please act now: Set appropriate national targets for reducing greenhouse gas emissions. Canada can again be a leader. Create a national sustainable development plan. Put in place strong policies that ensure we meet those targets, including a price on pollution, and incentives that accelerate adoption of cleaner choices. Francisca Quinn, Founder of Quinn & Partners, is a Clean50 honouree that has endorsed this important message to Canada’s COP21 delegation. We also congratulate our clients Lisa Lafave at Healthcare of Ontario Pension Plan and Philippe Bernier of Triovest Realty Advisors, as well as our strategic partners Coro Strandberg and Lisa DeMarco, in supporting this message. You can read the full letter here and find it in a special section of the November 24 Globe and Mail newspaper. With global property investors representing more than US$1.6 trillion in assets under management, the Global Real Estate Sustainability Benchmark (GRESB) survey has become the authority on real estate sustainability assessment. The annual survey is supported by global, leading institutional investors representing the “who’s who” of international capital. In Canada, institutional members include the Healthcare of Ontario Pension Plan, Ontario Teachers’ Pension Plan and Oxford Properties. GRESB’s adoption trajectory rivals that of The Carbon Disclosure Project (CDP), the largest major investor-driven sustainability initiative. Please contact Francisca Quinn, Managing Partner at Quinn & Partners for more information at Francisca @ quinnandpartners.com or (416) 300 8068. GRESB is an industry-driven organization committed to rigorous and independent evaluation of the sustainability performance of real estate portfolios. GRESB works in tandem with institutional investors and their portfolio managers to identify and implement sustainability best practices in order to enhance and protect shareholder value. I am very proud to be part of such accomplished and dedicated group of people. Francisca was named a 2014 Clean50 honouree thanks to her work with leading Canadian companies in reducing their environmental footprints and achieving high sustainability engagement scores from employees, customers and analysts. She uses business analytics and organizational change tools to design, implement and communicate industry-leading corporate sustainability programs. Francisca strives to set a personal example for sustainability by applying best practice at work and at home.